After the last post, I thought it was time for something light. Something crunchy. Something chock-full of yummy protein. I mentioned that the heat was interfering with my appetite. Well, I’m happy to report that it didn’t last long. It returned in time for me to enjoy the culinary pleasures of Cambodian cuisine, which is similar to Thai in that it uses many of the same ingredients, but dissimilar in that it isn’t nearly as hot and spicy. Although I love spice, I also don’t mind the lack of it because it enables me to taste all of the natural flavors in the dish, such as lemongrass, basil, ginger, and…crunchy grasshopper. 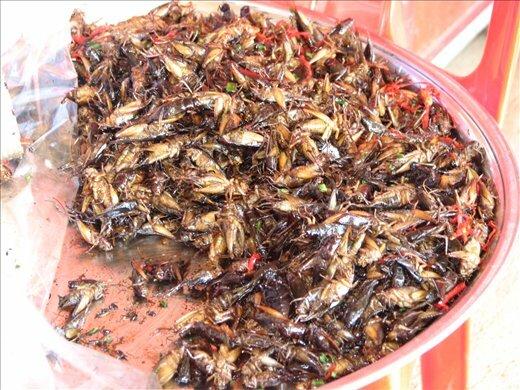 The bus to Phnom Penh stopped at a roadside “stand” in which a woman was selling the plump locusts from a large steel bowl. They had been fried all crispy and I’d been dying to try something really unusual, so I thought, what the hell? I bought a bag and tried my first grasshopper. It didn’t have a taste, really. It just tasted like something fried. The problem was the little bit that got stuck in my teeth, which I tried hard not to think about afterward. I told myself that I drew the line at locusts. That I’d refuse to eat anything with eight legs. Anything with fangs or little bits of hair sticking to its spindly appendages. But then, an unusual opportunity presented itself. At a lovely dinner at the home of a local family—after a delicious meal of curry, grilled meat, vegetables, noodles, and spring rolls—the host brought out plates of marinated, fried tarantula…large, black, hairy and still complete with fangs (but drained of their venom). My resolve began to weaken. At first, I looked at them and thought that I couldn’t even bring myself to touch one, let alone eat it. But then when others bravely sampled the little beast, I worked up the courage to pick up the dead thing (complete with little peppers and garlic clinging to the singed hairs on its body) and gingerly placed a leg in my mouth. I bit down and chewed. It was kind of crunchy and surprisingly good because it tasted of the sweet soy sauce in the marinade. After the spiders, when I felt pretty pleased with myself at how daring I’d been—even though others at dinner ate the entire tarantula and declared the torso even tastier than the legs—the time for spirits arrived. But not just any spirit. A strong, local rice wine that was 45 percent alcohol and infused with the essence of…more tarantulas. Lots more. In fact, the entire bottom of the jug from which the wine came was full of tarantulas. They are placed in the jug alive, then the rice wine is poured on top of them so that the spiders can impart their special healing properties as they drown inside the brew (I’m told tarantulas are good for back ailments). I don’t know about healing properties, but I had a few shots of that wine (maybe even three) and felt pretty darn good. And it tasted like sake…with maybe an occasional small hair or other body particle floating around in there. You know what they say about being in Rome.